There are several other creative strategies that you can use to make money in your business that don’t fall neatly into the broad categories of display advertising, affiliate marketing, selling products and services and monetizing your email list. Publish a Book – You can take the ideas that you write about on your blog, package them into a book and sell it on Amazon. While writing a book might sound like an overwhelming task, there are services like Archangel Ink (www.archangelink.com) that will do all of the heavy lifting for you, such as cover design, editing, layout, e-book formatting, etc. in exchange for a small fee. If you don’t have time to write a 30,000-50,000 word book, you can put together some of your best blog posts, have them professionally editing and publish them as a standalone book. I recently did this with some of my best blog posts in a book called Business Growth Day by Day, which can be accessed at www.businessgrowthdaybyday.com. To learn more about publishing a book on Amazon, I recommend visiting Steve Scott’s website, www.authority.pub. Create a Mobile App – If there’s a specific task in your niche that a piece of software can make easier, consider creating a paid iOS or Android app and promoting it your audience. To learn more about how to develop your own mobile app, read the book “Idea to iPhone: The essential guide to creating your first app for the iPhone and iPad” by Carla White. The book teaches you how to develop your idea, design your app, hire a developer and make a big splash with your launch. Land Speaking Gigs– Some entrepreneurs leverage their expert status to land paid speaking gigs at conferences and other events. This strategy can be lucrative when you are well known in your industry, but it can be a grind when you are first getting started. You probably won’t get paid for your first several speaking gigs and you will have to spend numerous hours preparing for each talk that you give. 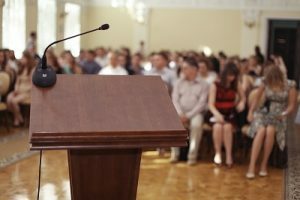 Because of the preparation, skills and travel required, promoting yourself as a public speaker isn’t for everyone. If you have the gift of gab and can put together a good presentation, marketing yourself as a public speaker might be a nice way to generate additional income. License Your Content – There are a few companies, like ACI Group (www.aci.info), that will license your content from you and sell it for inclusion in large research databases like Lexis Nexis. You won’t make a killing from these licensing deals, but if you produce a large amount of content, you could generate a few hundred dollars each month from a licensing deal with a company like ACI Group. Podcast Sponsorships – If you publish a podcast and gain a sizable audience, there are certain advertisers that may be interested in paying you to read an ad for their product or service on your podcast. You can learn more about getting sponsors for your podcast by checking out podcast advertising networks like Midroll (www.midroll.com) and Archer Avenue (www.archeravenue.com). Wow – I am so glad that I came across your website today. This was an incredibly helpful article, and I just want to say thank you for sharing these outstanding resources! I look forward to learning a lot more from you!